Bonded in Black PVD, this unique ring features a polished gothic cross in-laid on two sides of the ring. 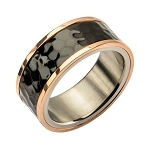 Black rings make a bold statement on any man's hand. It is a beautiful ring. I ordered the size that I typically wear, and it fits just perfectly. We bought the same exact ring for 110.00 from a jeweler in town. When I saw the same ring on justmenrings.com for 1/6 the price, I returned the ring and purchased it here. Same quality, amazing price... and no shipping! Can't beat it. This is a really nice ring for the price. It's honestly comparable to spending over $100 on a ring of the same quality. Quick shipping and great customer service! This was one of a few purchases made for my Husband for Christmas. He loves it! Size and quality are perfect, and shipping was fast (although I did pay for expedited shipping). I do think that the crosses could stand to be a bit bigger and closer together (which means adding 1 or 2 more), so that other people can see the crosses without too much effort. As the ring is now, if it turns a little on my Husbands finger, a cross isn't visible on top. Bottom line though, is that I would definitely recommend this ring and website to others! The picture doesn't do justice. 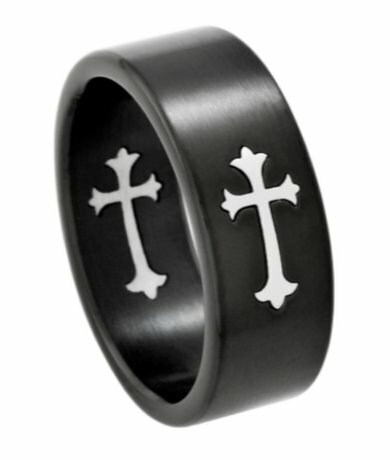 The ring is pure black and the Gothic Cross inlaid shows a strong contrast. This ring rocks.